When the apocalypse finally arrives, those with the booksmarts will be the upperymen. Maybe somebody you know will be the readerwriter and maybe somebody you know will learn how to make the brandywine and maybe you’ll have a bakerman among you but who will be the mather? The mather will be the one with the Slide Rule watch from Caliper, and friends, the mather can be you. This mechanical watch runs a Miyota 82S0 automatic movement and features a unique slide rule bezel that lets you multiply and divide even if all electric everywhere goes dead shapes and you and your tribe have to hide from the Face Eaters in an old mall. How does it work? To multiply, for example, align the first number to the first arrow and “find the second number on the same ring as the arrow and read across to find the result.” Division is a similar process. Caliper has outlined the instructions here and the watch can also manage currency and unit conversions. The watch costs $299 for early birds and the team is raising $50,000 on Kickstarter. They plan on shipping in February 2018 but I saw a working model complete with circular slide rule and was very impressed. The big circular slide rule they’re shipping with the watch is a great conversation piece for your desk and, if you’re an engineer or someone who wants to get their smartypants on at the market house in Dead Horse Bay, Brooklyn, then feel free to pull back your ragged sleeves and show the dumbsters what a mather you are and how easy pie it is for you multiplicate two numbers that the Old Peoples used to have to use iPhons to perform. 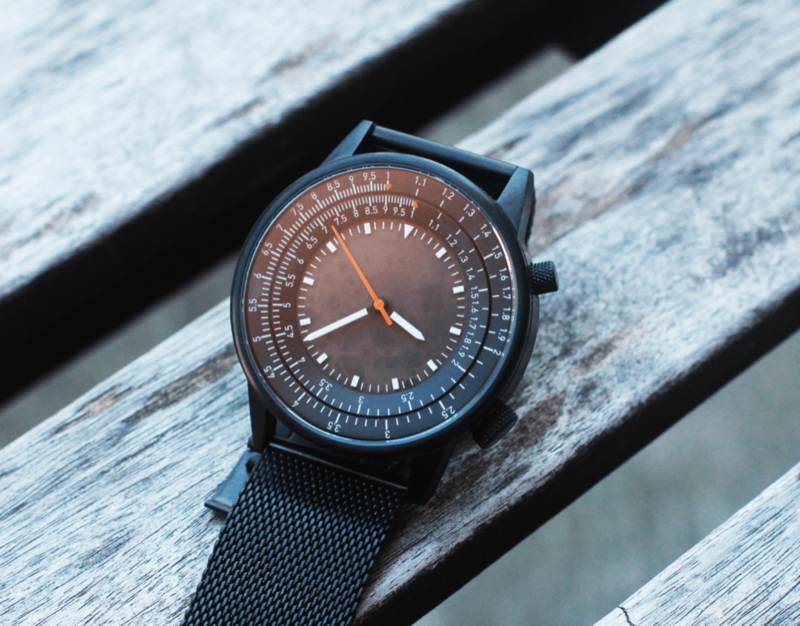 Caliper has already shipped its minimalist watches after a few successful Kickstarter campaigns and I’m really pleased with this one. It’s very rare to find a unique timepiece with a unique complication. Obviously Megapod and Breitling have made circular slide rules for a few years but they’re not quite as popular as, say, the eternally useless tachymeter and I’d like to see more of them. I’m glad that Caliper made a solid watch for a low price and added a feature that will help you convince the Goat Herders to join your war against the Trash Picksters by telling them exactly how much grazing land they will get if they burn the Pickster’s middens to the ground. Ultimately, I’m saying something like this might come in handy when the world ends.